Dr. Kristofer Sippel was born and raised in Scottsdale, Arizona. Kristofer is married to his incredibly supportive wife, Rita, and has two sons, Kristofer Jr. and Kenneth as well as three daughters, Katie, Kamrie, and Kacie, all who attend San Tan Charter School. He holds a Bachelors in English and a Masters as well as a Doctorate in school administration. Dr. Sippel has been with San Tan Charter School since its inception back in 2005 serving as the Principal of San Tan Learning Center. 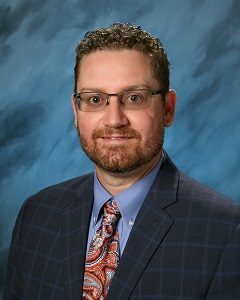 Dr. Sippel will continue his position of CEO/Superintendent at San Tan Charter School as the school moves into its 13th year of service to the community. Dr. Sippel manages the day-to-day operations and the growth and development of a hyper-growth charter school taking San Tan from 45 students in 2005 to over 1200 students for the current school year. Dr. Sippel has been in education for over two decades serving students as a Reading Teacher, High School English Teacher, Dean of Students, and Assistant Principal. Dr. Sippel has received numerous awards and recognition. For the fourth consecutive year, he was featured in the East Valley Tribune as a top school educator. Additionally, he has served as a Library Board Member, Parks and Recreation Board Member, and a City Council Member for the City of Apache Junction. He currently sits on the Tepeyac Leadership Board of Directors and is a member of the Mt. Claret Retreat Center’s Advisory Council. Dr. Sippel is active throughout the Town of Gilbert as well; most notable was his service as the Chairman of the Planning Commission for the Town of Gilbert. Dr. Sippel believes that it is his life mission and calling to provide an amazing education experience to all students.